And then I heard a POW! | Random moosages as I see fit. And then I heard a POW! I’m late. I know. I’m sorry. There were…things…that needed to be figured out. In case you’re wondering, that jagged hole is about 3/4″ long. Not. Patchable. I was on my way to work on Tuesday and because I left later than I wanted, I had to detour from my normal (shortest) route because of traffic. I was on the 60WB and mere miles from the 605 when I heard quite a bit of commotion on the right side of my car. I know I had run over something and that something sounded heavy, but I didn’t immediately feel anything different and I didn’t see anything in the rear view mirror, so I opted to continue driving for awhile to see what would happen. Well, my car started feeling sluggish on the right side. I don’t know any other way to describe it. It felt sluggish. And only on one side. And I felt something similar before…when I have a tire doing its best to deflate itself. And sure enough, a few seconds later my low tire pressure light comes on. I was able to pull off the freeway and into a very accommodating Jack in the Box and listened to my tire hiss alarmingly for awhile. Then I proceeded to change my tire. I did not appreciate the stares I got from people walking into the restaurant. I also did not appreciate that they stared and didn’t offer to help. Not that I needed help. I mean, I was even dressed for the job of changing a tire. Yes, I was going to work but I often work in manufacturing facilities. That means jeans are perfectly acceptable and I almost always wear steel toed boots. I kind of wish that I put a pair of work gloves in the trunk like I’ve been meaning to since I collected Puddul from the dealership, but whatever. Washing your hands isn’t that big of a deal. 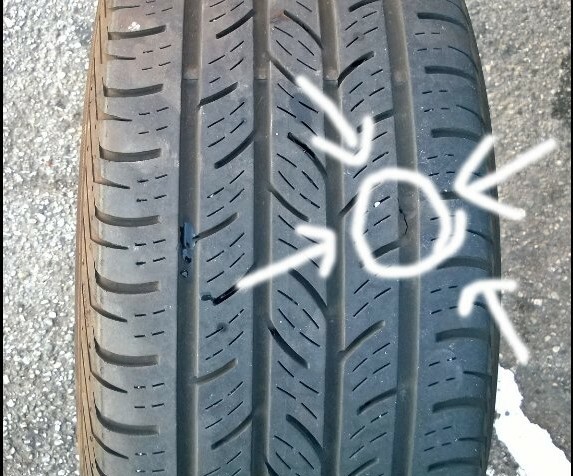 Anyway, I got the tire changed, which I apparently can do in less than 10 min now, I am so practiced, and took a look at the flat tire. It had a very large, jagged hole in it. It was obviously not salvageable. It made me very sad. Because this was the third tire I’ve had to replace. Actually, third and fourth, because my tires were at about half their lifespan and I couldn’t just change the one without messing up my alignment.